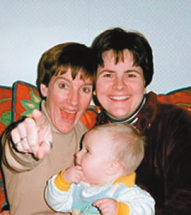 Lisa Miller is the one-half of a Vermont lesbian couple that conceived daughter Isabella with partner Janet Jenkins — and then abducted Isabella and took her to Virginia. There, prejudiced state courts violated Vermont’s family-law jurisdiction over the family and allowed Miller to violate Jenkins’ visitation rights until the court rulings were overturned by Virginia’s Supreme Court in 2007. Since then, Miller lived more-or-less openly as a fugitive — violating Jenkins’ visitation rights, showcasing her daughter as a Christian Right political trophy, and sharing her story of troubled celibacy and sexual confusion (which she described as an ex-lesbian fundamentalist freedom) to Christian Right media. Then, late last year, because Miller had violated Jenkins’ visitation rights since 2004, a Vermont judge issued a final ruling granting sole custody of Isabella to Jenkins. By the time of that ruling, however, it appears that Miller had already absconded with Isabella again. Miller abandoned her Virginia home and left her lawyers at the fundamentalist Liberty Counsel supposedly unaware of her wishes and whereabouts, even as they continued to represent Miller in court. According to the National Center for Exploited and Missing Children, Lisa Miller and Isabella Miller-Jenkins are now officially listed as missing and the case is classified as family abduction. LezGetReal now believes that Miller is hiding as a “missionary” in Quito, Ecuador, using a church group affiliated with HCJB Global as shelter for the abduction. We hope that U.S. and Ecuadorian authorities urgently investigate.